Apple is known for vigorously defending its intellectual property, and while some might claim that it often takes things too far, from Apple's perspective, it often doesn't have much of a choice. In the most recent example, Apple is taking Woolworths to court over a new logo which they claim is too similar to Apple's logo and might result in customer confusion. Woolworths, not to be confused with the US based retail chain Woolworth, is the largest retail company in Australia and New Zealand, and they recently came out with a new 'W' logo which to a certain extent does resemble Apple's. But what bothers Apple more than the logo itself is where exactly it might end up. Woolworths has reportedly filed for a blanket trademark for its new logo, meaning that it potentially may end up on every sort of product imaginable, including electronic media devices. Presently, Woolworths is focusing on its chain of supermarkets and its branding has yet to extend into consumer electronics, but when it comes to trademark protection, it's often easier to prevent a troublesome situation from arising early on than attempting to fix it later. For what it's worth, the Australian based Woolworth has already slapped its brand on mobile phones, so it's not too far fetched to assume that it may also end up on electronic products such as MP3 players that compete in the same space as Apple's. Regarding future plans for the Woolworths brand appearing on electronic devices, a Woolworths spokesman recently told the Australian based The Age, "While we can't rule anything out, we haven't got any plans at the moment." Woolworths new logo debuted about a year ago, and it's often referred to and described as a 'W' as opposed to an illustration of an apple, but Apple apparently doesn't want to take any chances, especially considering that the logo may soon start to pop up on retail store fronts where Apple also competes. Apple, as expected, hasn't commented publicly on the matter, but this isn't the first time that Apple has created a stir over its efforts to protect its iconic logo. Almost a year ago to the day, Apple wrote a letter to the Canadian-based Victoria School of Business and Technology informing them that their school logo too closely resembled Apple's and infringed upon their trademark. In a letter to the school, Apple wrote that the logo gives the general public at large the false impression that Apple authorizes the school's "activities", which presumably refers to the computer software courses offered at the school. Apple's actions drew a wave of criticism as people scoffed at a big Silicon Valley company taking a small school to task over something as innocuous as a logo, but when it comes to trademarks, if a company doesn't actively protect them, it becomes significantly easier for infringers to to survive subsequent legal actions against them. 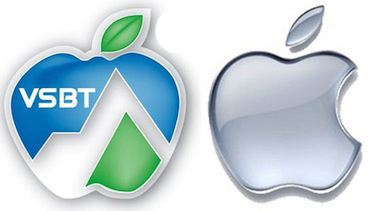 While some might reflexively exclaim that Apple is trying to prevent any other company from using an apple in their logo, the reality is that Apple is only protecting its logo to the extent that it pertains to companies that in any way engage in activities that might reasonably be construed to be associated with Apple. In other words, if you want to open up a bakery and use an apple styled logo, there's nothing Apple can do to stop you. But if you open up a computer repair shop, then Apple will obviously take legal action. That being the case, the above two mentioned examples fall somewhere in the middle, and those are exactly the type of cases that elicit such a vocal public response. So taking a look at the most recent example, is there an overt resemblance between the Woolworths 'W' and the Apple logo, or is Apple paranoid and overstepping its bounds?